Welcome to Career Key Central, the group administration portal for Career Key Discovery! There are four main steps to getting up and running with Career Key Central. Invite your clients or students (discoverers). 1. GEAR ICON: Account settings at the customer level, and organization level settings. Learn more about the group portal’s Account Hierarchy. A customer can have multiple organizations, but starts out with one default organization assigned to itself. 2. LEFT NAVIGATION: Main Dashboard navigation, primarily focused on discoverers and their activities. 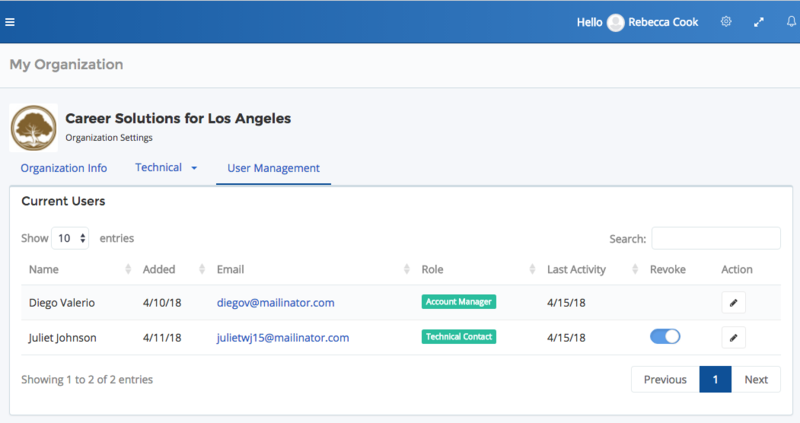 You can add your organization’s logo to Career Key Central so your counselors and other colleagues feel more at home. 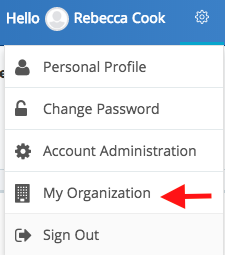 Click on the Gear icon from the top right hand corner of the website and select My Organization. You will automatically view the Organization Info tab. If there is no organization logo image there or you want to change the image, click the Choose Upload button. Next, click on the folder icon and select a logo file from your computer. If it is a .png image, you may need to re-save it as a .jpg in order to use it. Move the white selection box where desired and click on Crop and Save. CKD Plug In is properly installed on your web page. In 10 minutes, take the Career Key Discovery assessment to identify [your organization’s] programs that fit your career interests. In 10 minutes, match your personality and interests to careers that fit who you are, for greater job satisfaction and career well-being. Return later to explore choices and make a great decision! In 10 minutes, match your personality and interests to careers and [your organization’s] majors that fit who you are for greater academic success. Return later to explore choices and make a great decision! To see how we describe Career Key Discovery (CKD) to the public that makes individual purchases, please visit our CKD for Individuals product page. 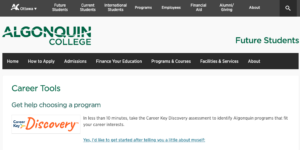 You can also link to any pages on the Career Key website. Careers and only the majors my higher education institution offers. Only the majors my higher education institution offers. Scroll down below current users. Under Invite User, add the email address for your Technical Contact. Select the Technical Contact check box. Customize the default email message with (a) where you want discoverers to see the plug in, and (b) what, if any, changes to the CKD plug in configuration you’d like. Your Technical Contact will show up on the list of users when they’ve accepted your invite. We will email them instructions for installing the plug in and should inform you when CKD has been added to your website and is ready to go. 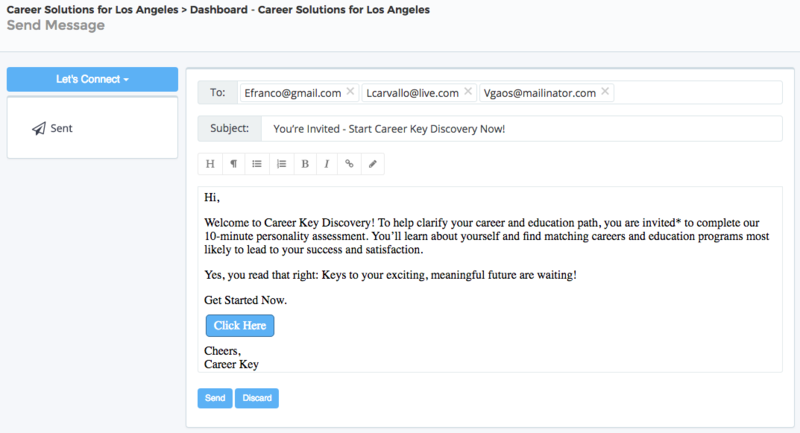 Career Key Central allows you to invite different types of users: counselors and your technical contact. They’re all invited using the same simple process. Under Invite User, add their email address. Select a Role for your user. Customize the default email message if necessary. Note: invited users will not show up on your user list until they’ve accepted your invitation. Complete Steps 1, 2, and 3 above before starting to use CKD with your discoverers. You’re ready to publicize CKD to your discoverers and invite them to start Discovery! Discoverers log into your website and you direct them to the page hosting the CKD plug in. Discoverers receive an email invitation from you, with an access link. #2 requires that you create a group in Career Key Central and upload discoverers’ information into it, which we cover next. Once you’ve created a group this way, you can send all its members an email inviting them to start. 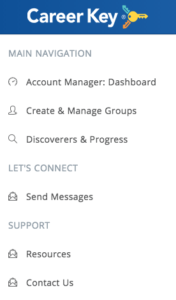 Select Create & Manage Groups from the Left Navigation Menu. Add a Group Name and Description for your group. Upload a .csv file with your group participants. The .csv file contains the following headings in this order: First Name, Last Name, and Email. To make it easy, you can download the sample .csv file and add your data to it. Once you’ve uploaded a group, you can send the Invite to Start message after installing the CKD plug in on your site. Communications are generally initiated from the Discoverers & Progress List. Select Discoverers & Progress from the Left Navigation Menu. 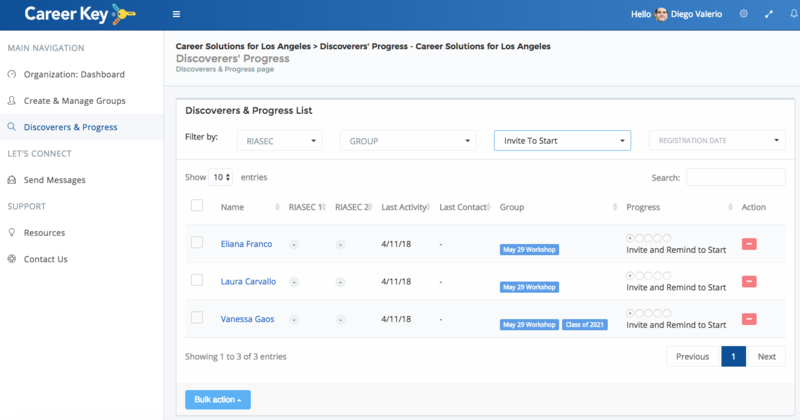 Select the Group you’ll be working with to load that group’s discoverers. You can filter by the top two RIASEC personality types, Last Activity, Progress, and Registration date, the date the discoverer started CKD. 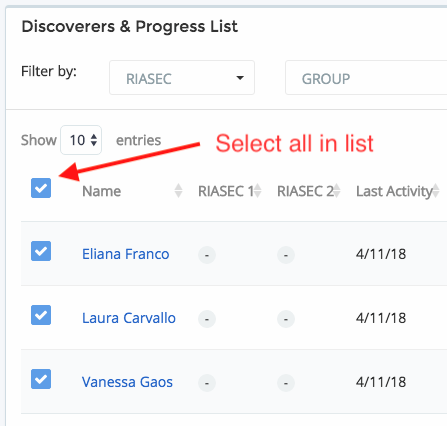 After selecting your group and applying your filters, use the check boxes to select specific discoverers or the top check box to Select ALL Discoverers in the list. Select Bulk Action/Let’s Connect/Invite load the starting email message. A sample email to your discoverers will load. You can customize it as much or as little as you like. Click the Send button to send or the Discard button to discard your email. After your first message has been sent, you can filter discoverers by where they are in the Discovery Process as well as their personality type to continue to guide them through Discovery. There are 4 progress milestones in CKD: Not Yet Started, Completed Assessment, Started Profile, and Returned to Profile. 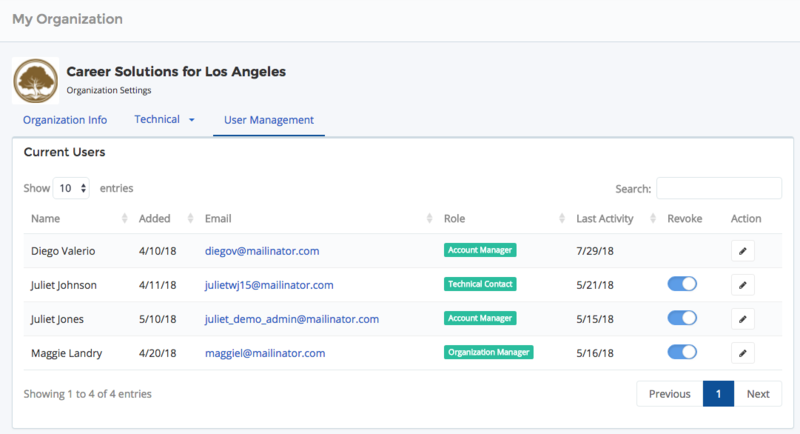 Bulk Actions include Let’s Connect, and Export. We will be adding a future feature to archive and delete data. You can assign discoverers to a counselor by groups. To assign just one discoverer, locate them in Discoverers and Progress and assign them to a group. 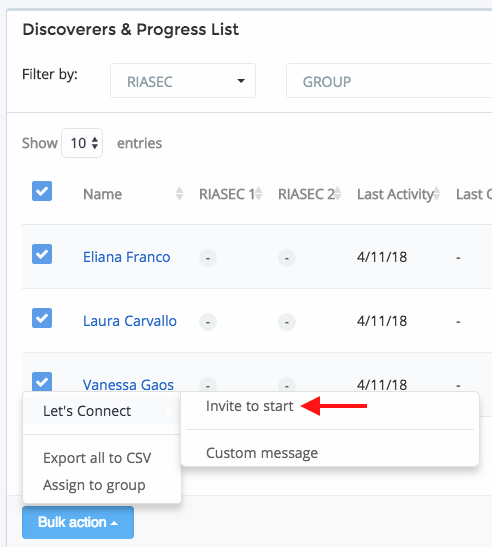 To assign a whole group of discoverers, go to Create and Manage Groups. Click on the group view in the Groups List, then click on the Assign button below it on the line that says, Currently Assigned Users.